The investment world is a risky and confusing place right now. Part 1 of this article (The Next Crisis: Spiralling Inflation) detailed the reasons why the next stage in the financial crisis will almost certainly be spiralling inflation. This article (Part 2) provides a solution for investors who are looking for a way to shield their hard-earned wealth from the destruction of high and uncontrollable inflation. The global response to this crisis has been chaotic and ad hoc. The key policy plank seems to be to throw money at the problem until it goes away. Because it is determined to ward off a deflationary spiral at any cost, the Federal Reserve is pumping trillions of dollars into the US and global economies by purchasing massive amounts of treasury bonds and mortgage-backed securities. In order to do so, the Fed has had to balloon its balance sheet to over $3 trillion in assets (from a normal level of under $1 trillion). Much of this has come from printing money out of thin air. A shrinking dollar, decreasing purchasing power and the destruction of real wealth are the major consequences of inflation. Fortunately, gold and precious metals preserve their purchasing power, no matter how high inflation gets. Because precious metals are priced and traded in depreciating US dollars, they will surge in value as the dollar shrinks. For the past several decades, inflation has been ravaging our purchasing power, but few have noticed. 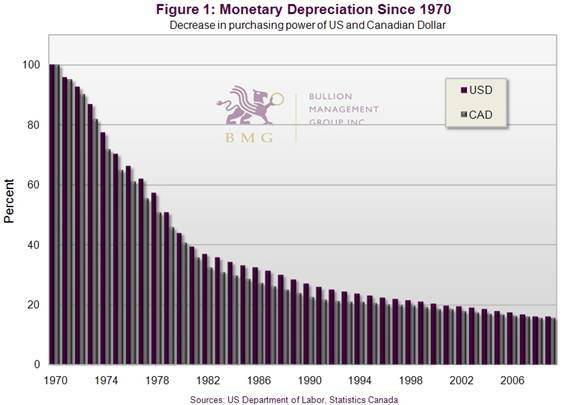 As Figure 1 shows, the US and Canadian dollars have lost over 80 percent of their value since 1971. Not coincidentally, this was the year the link to the gold standard was cut. Yet while the world’s currencies have declined precipitously, the price of gold, silver and platinum have surged. Before we examine investing in precious metals, it is important to dispel some common myths that surround gold, silver and platinum in general and gold in particular. No other asset class is burdened by so much disinformation as is gold. Investors who do not take the time to examine why they should allocate part of their portfolio to precious metals are missing out on the opportunity to add a unique asset class that diversifies, protects against inflation and, in secular bear markets, provides better returns than traditional financial assets such as stocks and bonds. Critics frequently remark that since gold peaked at $850 per ounce in January 1980, gold’s return has been poor compared to the major stock indices. However, that peak price was a short-lived, single-day aberration. Investors who avoided the mania phase by purchasing gold one year earlier in 1979, were buying at an average price of $306 per ounce. Thus, they would have avoided any significant losses during the subsequent bear market. Bear markets last a long time no matter what asset class is involved. The previous bear market cycle in stocks lasted from 1968 to 1980, and saw the Dow remain flat for 17 years. Gold, meanwhile, surged by 2,300 percent. Most money managers today are not old enough to have experienced the last bull market in gold or the 1964–1982 bear market in equities. Their entire investment experience has been confined to one cycle - the biggest and longest-running equity bull market in history. In the current cycle, which began in 2002, gold has increased by over 300 percent, while the Dow has been flat to negative. Yet while gold has risen to $1,000 per ounce, its price still has a long way to run. The arguments against gold as an inflation hedge are usually based on calculations arising from its intra-day price spike in 1980. While gold did not keep up to inflation from the 1980 peak price to 2002, the annual average gold price has kept up extremely well since 1971, when the price was no longer fixed. During the same timeframe, both the Canadian and the US dollar lost about 84 percent of their purchasing power. In fact, all the world’s major currencies have depreciated by significant amounts due to continuous excessive increases in the money supply. The impact of this devaluation on real returns is significant. Conversely, gold has not only maintained its purchasing power but increased it against all major currencies. It will continue to do so as long as the world’s central banks keep increasing the money supply by a greater percentage than their country’s GDP growth. Risk means different things to different investors. A pension fund may perceive risk as a failure to meet its liabilities, whereas an asset manager may view risk as a failure to meet its benchmark. Most investors, however, associate risk with a loss of their capital or underperformance of their investments in comparison to their expectations. “Risk comes from not knowing what you are doing,” according to Warren Buffett. There are many kinds of risk: currency risk, default risk, market risk, inflation risk, systemic risk, political risk, interest rate risk and liquidity risk. While all of these apply to financial assets, most of these risks do not apply to gold bullion. Physical bullion is not subject to default risk, liquidity risk, political risk, inflation risk or interest rate risk. Unlike financial assets, gold bullion cannot decline to zero, and gold is the only asset that can protect wealth from non-diversifiable systemic risk. The Bank of England used this argument to justify selling half the country’s gold holdings at the bottom of the gold market in 1998. It wanted a “safe” investment, one that would generate interest, and it chose US Treasury bills. Its gold was sold for under $300 per ounce. In the months following that sale, the price of gold tripled, and the value of the US dollar lost 30 percent against the British pound. The currency exchange losses plus the opportunity cost resulted in billions of pounds in losses, significantly offsetting any interest income the Bank might have received. The same is true for bond investors. In an inflationary environment, the “real” or inflation-adjusted interest rate they receive is often negative. Gold’s capital appreciation potential is many times greater than the prevailing interest yields, while not being subject to any of the risks that interest-bearing investments are subject to. Investors who take the time to carefully evaluate the benefits of bullion will realize that these and other commonly held myths simply do not hold up to scrutiny. An investment in gold and precious metals bullion is not speculation; it is a means of preserving wealth, especially in times like these. Wealth is never an easy thing to protect, but it is most difficult when inflation is unleashed. Just take a look at the 1970s to see how devastating double-digit inflation was to personal wealth. Stocks sank and didn’t start to recover for 17 years. Unlike stocks and bonds, precious metals provide the protection portfolios so desperately need because they move in the opposite direction to stocks and bonds. This is not a trade secret or some investor’s cockamamie theory. It has been proven with research. Let’s examine each of them, one by one. On an inflation-adjusted basis, US stock markets have lost close to 40 percent of their value during the past nine years. But that was before trillions of dollars began being created out of thin air. The more dollars that are created, the less each one is worth. A shrinking dollar means rising inflation and falling wealth. Because precious metals are the world’s only non-depreciating currency, they protect investors against the continually shrinking US and Canadian dollars. It is crucial to understand that since most portfolios are measured in depreciating dollars, the real value of portfolios is declining every year as decades of inflation steadily erode the value of accumulated wealth. But when inflation spirals, the erosion becomes a tsunami. Did you know that a modest 3 percent inflation rate will cut a portfolio in half in just 24 years? Or that a 6 percent inflation rate will cut a portfolio in half in just twelve years? These are disturbing numbers. The US government and the US Federal Reserve have so far pledged an astonishing $12.8 trillion in bailouts and stimulus programs. That is nearly the total amount of US GDP, or Gross Domestic Product. And this number does not even include America’s $100 trillion liability: its unfunded public health and pension obligations. When the bulk of US government spending gets underway, and the banks begin lending again, inflation will be unleashed in full force, and portfolios will suffer if they do not have a substantial allocation to precious metals. There is much confusion about the definition of inflation. Some believe inflation is raising prices. The accurate definition of inflation is an excessive increase in the money supply that leads to rising prices. Increasing money supply is the cause; increasing prices are the effect. In recent years, studies show that most industrialized countries have been increasing M3 by more than double the reported increases in the Consumer Price Index (CPI). 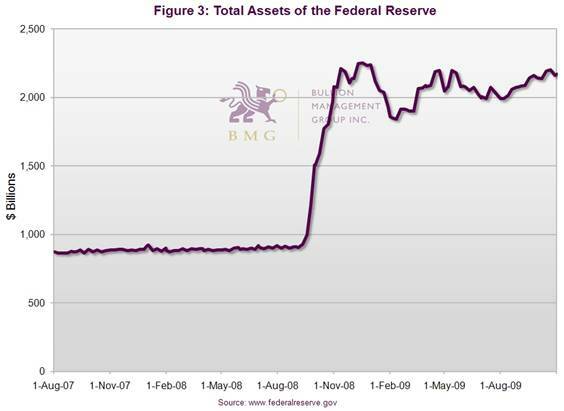 And now, in an effort to contain the crisis, the US Fed’s balance sheet has exploded, as can be seen in Figure 3. The US Fed’s balance sheets have exploded in recent years. bullion after all these years? Because they know that bullion is money and can be used for trade if their currency becomes worthless. Although central bankers are fierce supporters of paper-based currencies, investors should look to their actions and not their words to see what they really think about precious metals. This year, central banks became net buyers of gold for the first time in 22 years. If the money supply is increased too quickly, the compounding effects of interest payments can ultimately lead to hyperinflation, which is generally defined as greater than a 4-digit annual percentage rise in prices. Hyperinflation creates a vicious circle in which the widespread desire to spend rapidly depreciating money results in skyrocketing prices that soon make the currency virtually worthless. In a hyperinflationary environment, goods and services become so costly that no one can afford them, a country's currency becomes worthless, international trade ceases and economic chaos ensues. A classic example of this occurred during the reign of the German Weimar Republic from 1919-1923. In 1919, one ounce of gold was 75 marks. By 1923, it was 23 trillion marks. But Germany is just one of numerous cases of hyperinflation since the beginning of the 20th century. M3has been growing at an alarming rate of 11 percent for years. In 2009, we have entered the early stages of a global government spending spree of unprecedented proportions that, coupled with zero percent interest and extraordinary money supply growth, will inevitably be hugely inflationary once the credit markets return to normal. Financial assets will continue to lose purchasing power in this kind of environment, but gold and precious metals will hold theirs because they are a proven hedge against inflation and against an investor’s worst enemy, hyperinflation. While previous hyperinflations were contained within a single country, this time it is likely to be global in nature because of the reserve status of the US dollar. The US money supply has been growing at an alarming rate for years, and in 2008, despite a slowdown in lending and credit, money supply still grew dramatically with M3 (the broadest measure of money supply) increasing at about 11 percent, as Figure 4 shows. Over the long term, M3 increases have been the best leading indicators of future increases in the price of goods and services. Precious metals are the only currency to own when central bank printing presses are debasing global currencies at a historic rate. And because they are a proven store of value, precious metals may be the only asset class that will preserve your portfolio’s purchasing power as we enter a prolonged period of inflation or stagflation. Since precious metals are the only asset class with a positive correlation coefficient with inflation, if inflation heats up, so too will the price of precious metals. Studies by Wainwright Economics show that gold is also an excellent predictor of inflation when compared with other measures such as the CPI and oil. In fact, many of the world’s leading financial authorities rely on gold prices as a predictor of future inflation, including former US Fed Chairman Alan Greenspan. In addition, precious metals’ upward climb will also be spurred by the imbalance between aboveground bullion and the money supply (the money being printed and released into circulation by the world’s central banks). This year, total global supply of investable aboveground bullion will reach $1 trillion, while US money supply alone will amount to ($14 trillion). This enormous disparity cannot continue without a significant upward price adjustment in gold. What investors experienced in 2008 was not price deflation. It was depreciation in asset values. Stock and real estate values fell, but the cost of living did not. Deflation is a highly unlikely scenario because the central banks are publicly committed to printing as much money as needed to prevent it. But if deflation were to occur, precious metals investors need not worry. Since cash is king during deflation (the further prices fall, the greater cash’s purchasing power), and since precious metals is money, its purchasing power will grow during a deflationary period. A major study by Roy Jastram, “The Golden Constant”, concluded that gold preserved purchasing power during periods of inflation as well as deflation. During a deflation, gold’s purchasing power increases because every ounce of the metal buys more goods or services the more prices drop. During the deflationary deleveraging of 2008, for example, the value of virtually every investment tumbled, but gold bucked the trend, rising 5 percent. Most investors know their portfolios should be fully diversified, yet they continue to be invested in only stocks, bonds and cash. But it is hazardous to your wealth to invest in so few asset classes. While cash may seem to be a safe haven, it won’t protect against rising inflation because (as we have seen recently with money market funds) it can lose value in both nominal and real terms. Low or negative correlations between asset classes are the basis for diversification, but few investors realize that because today’s sophisticated financial markets are globally integrated; they all tend to move together. Only precious metals provide the necessary negative correlation to stocks, bonds, real estate and Treasury bills, so they historically rise in value when stocks, bonds, real estate and Treasury bills fall. That’s why no other investment reacts to market downturns as well as precious metals bullion. 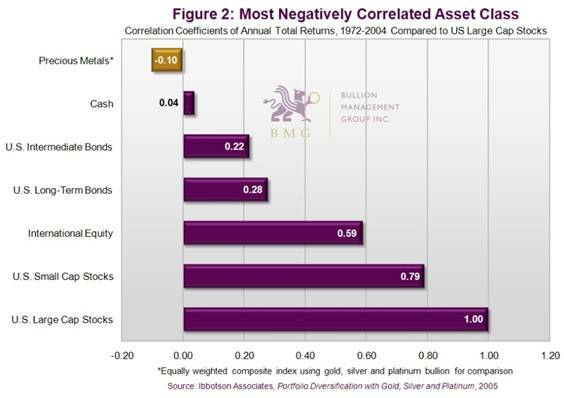 As Figure 2 shows, precious metals are the only asset class that is negatively correlated to large cap stocks. Without them, your portfolio has no diversification at all. It may seem that a mix of growth stocks, value stocks, emerging and developed market stocks, large cap, mid cap and small cap stocks would provide adequate diversification protection, but because they are all the same asset class – equities – they tend to move together. The secular bull market in precious metals began in 2002, and entered its second phase in the summer of 2005. Secular investment cycles are normal, and stocks are highly sensitive to these cycles, as confirmed by recent data. Since the 21st century began, the S&P 500 has gone absolutely nowhere. Meanwhile, gold and silver have soared nearly 300 percent, while platinum has gained 185 percent (Figure 5). In 2008, McKinsey & Company reported that the value of the world's equities declined by $28 trillion, or almost half their value. Though the markets have rebounded lately, only some $4.6 trillion in value had been gained between December 2008 and the end of July 2009. In total, declines in equity and real estate wiped out $28.8 trillion of total global wealth in 2008 and the first half of 2009. Many stockholders are coming to grips with the ugly truth: supposedly diversified funds just end up tracking a declining market, while 75 percent of all actively managed funds underperform the market. This last fact is just common sense. After all, it is impossible for the majority of fund managers to outperform the market because they are the market. History shows us that the market trends into and out of secular (long-term) bull and bear markets over 15- to 25-year cycles. Has bullion had its run? Not if you pay attention to producers such as Barrick Gold Corporation and AngloGold Ashanti. They are de-hedging in the face of rising prices and buying back their hedge books at a stiff premium to avoid further losses. Clearly, they believe gold prices will continue to rise. According to Scotiabank, gold is projected to reach at least $1,400 per ounce in 2010. The continued rise in price is supported by the Dow:Gold Ratio, which measures trend changes in the price of gold versus a basket of stocks as represented by the Dow. There is still plenty of time for investors to rebalance their portfolios with gold. The Dow:Gold Ratio divides the Dow by the US-dollar gold price. As Figure 6 shows, when the purple line is rising, as it did in the 1920s, the 1960s and the 1990s, it tells us that the Ratio is rising and we are in a bull market for stocks. When the Ratio is falling, as it did in the 1970s and is doing today, it tells us that we are in a bull market for gold. Currently the ratio is less than 10:1 and equally important, is falling, meaning there is still plenty of time for investors to rebalance into gold and precious metals. It is vital to rebalance your portfolio when a major trend change occurs, not only to reduce risk but also to maximize your portfolio return. Precious metals bullion can successfully protect portfolios from a variety of shocks including systemic risk, currency crises, stagflation and inflationary depression. After exhaustive research, British economist Stephen Harmston reported in a paper entitled “Gold as a Store of Value, Research Study No. 22” that gold has held its purchasing power every time financial assets have declined in value. This once again proved to be the case in 2008 as gold appreciated in value while the markets and the economy melted down before our eyes. Precious metals offer the ultimate protection against what economists call “fat tail” events – sudden, unexpected financial crises. Examples of fat tail events are war, terrorism, natural disasters, health pandemics and systemic financial risks such as a derivatives accident, bankruptcy of a major bank or a major corporation, defaults on bonds, derivatives contracts, insurance contracts and disruption of oil supply. When any of these occur, traditional financial assets suffer while the price of precious metals tends to rise dramatically. 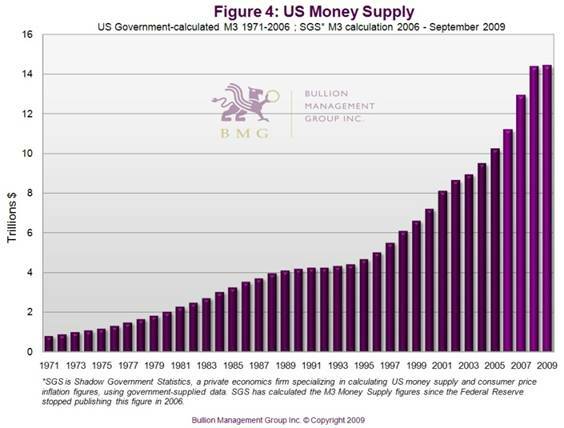 Ibbotson Associates confirmed this by reporting that “during periods of stress [precious metals bullion] provided returns when they were needed most.” The US Fed continues to print trillions of dollars in an effort to reflate the economy, which means money supply growth will be explosive. If history is any guide, this will lead to a US dollar currency crisis. If US dollar holders like China become tired of US monetary policy and decide to stop buying US Treasuries, it is possible that America could become the new Argentina and default on its debt. The destructive power of uncontrolled money expansion has already been experienced in Mexico, Brazil, Argentina, South-East Asia, Japan and Russia. Each experienced a major currency crisis accompanied by plunging stock markets and collapsing real estate markets, while many bonds and other debt instruments became worthless. In all of history there has not been a paper currency that has not become completely worthless... not one. Precious metals prices increased dramatically during these currency crises, acting in their traditional safe-haven role. Only precious metals provide an assured store of value under any type of market. But not all precious metals investment vehicles are created equal. Take mining stocks, for example. They tend to be significantly more volatile and risky than physical bullion, and during sharp market declines they tend to follow the broad equity markets downwards – even if the price of the metal is rising. During the stock market crash of 1987, for example, mining stocks declined by a greater amount than equities in general, while the price of gold increased. Mining companies are exposed to many operational risks and can decline to zero; bullion cannot. Figure 7 shows the different investment vehicles based on inherent risk. Each of these methods carries a different risk/reward profile. During periods of economic uncertainty, wealth preservation is critical, and unnecessary risk should be avoided. That is why gold certificates and gold ETFs are not appropriate substitutes for direct allocated bullion ownership. These derivative vehicles create many unanswered questions and have come under growing scrutiny from the precious metals community in recent months. The best investment strategy for long-term investors seeking low risk with secular growth potential is unencumbered physical bullion. As you can see, bullion forms the foundation of the Precious Metals Risk Pyramid as it offers the lowest risk. There are many ways to invest in bullion, but there is only one way to invest if your goal is absolutely secure wealth protection. For full details, read our Special Report, “How to Invest in Precious Metals”. The world has become a riskier place, volatility has become the norm, and systemic risk is a constant threat. This is a major reason why China and India are buying tens of billions of dollars worth of gold. In this uncertain environment, investors looking for peace of mind should look to a proven store of value. Stocks and bonds cannot provide that assurance because many of them can, and have, collapsed and gone to zero. Cash and fixed income may seem guaranteed, but in an inflationary environment their value will be quickly eroded, producing a guaranteed loss. Don’t confuse a bubble with a secular growth story that has many years to run. When we compare the current market to the bull market of the 1970s, it becomes apparent that we are still in the early stages of what could be a 20-year cycle. Determining whether the trend will continue is as simple as looking at the key drivers for precious metals price increases: increasing concern about the weakening US dollar, exploding US debt and rising oil prices. Since precious metals are a store of value and are priced in US dollars, a shrinking US dollar should automatically push metals prices higher. Now is the time to move into precious metals during its secular growth trend because tomorrow may be too late. In a secular bear market for stocks, no amount of diversification within three traditional asset classes (stocks, bonds and cash) will prevent portfolio decline. A portfolio allocation of at least 10 percent (but preferably much more) to physical bullion will reduce overall volatility, improve returns and provide excellent portfolio insurance. How much you should have in your portfolio depends on your time horizon and investing needs, but Ibbotson Associates recommends between 7 percent and 16 percent, while Wainwright Economics recommends between 18 percent and 47 percent during an inflationary environment. But to make money in these troubled times, you will need an even higher allocation in precious metals than those recommended by Ibbotson and Wainwright. Maintaining a portfolio without any allocation to bullion is not only highly risky but irresponsible. Precious metals bullion represents just a fraction of one per-cent of the value of global financial assets. Yet even after eight years of gains from $250 to $1,100 for gold, from $4 to $17 for silver and from $400 to $1,300 for platinum, most individual investors have no allocation to precious metals whatsoever. As a result, their portfolios are defenseless against systemic risk, the ravages of inflation and further market declines. Gold is both a currency and a commodity, but because supply is limited and production costs are high, it is a very rare commodity. Global financial assets such as stocks and bonds may not be commodities, but they are as plentiful as apples on trees, as Figure 8 demonstrates. Total global financial assets are valued at an enormous $145 trillion, which is more than twice global GDP – and this is after the financial meltdown. Compare that number to a mere $1 trillion, which is the total value of all the available, investable, aboveground precious metals. Those who say bullion is in a bubble should rethink their assumptions, because bullion is currently priced at a mere one percent of financial assets. Gold has always been money, and now it is reassuming its traditional role as the ultimate currency. Will it replace the US dollar as the currency of choice? We will soon find out. But one thing is clear. Even a modest 10 percent portfolio allocation to gold by central banks and individual investors would send $15 trillion in new money into a $1 trillion market, sending prices soaring. Bullion represents only one percent of global financial assets. There is no need to time the market as the bull has many years to run, and if you are a long-term investor, consider an equal mix of precious metals mining stocks and physical bullion to reduce volatility. If bullion was in a bubble, mainstream magazines would be screaming “buy gold”, and the public would be buying en masse. But the public is not buying – at least not yet, and that’s why now is the perfect time to start dollar-cost averaging into physical bullion. What about ETFs or other precious metal proxies? Precious metals investment vehicles such as ETFs, futures contracts, options, certificates, pooled accounts and even mining stocks are better suited for speculation because they bring risk into the equation. In contrast, bullion that is owned outright and stored on a fully insured, allocated basis with an accredited custodian is low risk, and should form the long-term foundation of any truly diversified portfolio. Today, buying and storing allocated bullion has never been simpler. Investors can own units in a physical bullion fund, or they can privately and securely purchase bars of gold, silver and platinum in large bar sizes and have them insured and securely stored at a registered LBMA vault. Visit BMGBullionFund and BMGBullionBars to learn more, or read our Special Report, “How to Invest in Precious Metals” at www.investinpreciousmetals.ca. Bullion is a permanent store of value. It is not someone else’s promise of performance or someone else’s liability, like stocks and bonds. Promises can be broken and liabilities defaulted on, as stock and bond holders in Bear Sterns, Lehman Brothers, Enron, General Motors, AIG and Nortel Networks can attest. Gold, silver and platinum bullion cannot be created at will by central bankers or governments. They will retain their value when many of today’s stocks are nothing more than a distant memory. The US Fed and central banks have been implementing loose monetary policy for decades. But now, for the first time in history, the Fed has an unlimited ability to create as much money as they need to “reflate” the economy. Richard Fisher, president of the Dallas Federal Reserve, says America has dug themselves a very deep hole through unfunded retirement and health-care liabilities that “we at the Dallas Fed believe total over $99 trillion”. In an environment in which trillions of dollars are being created out of thin air, government debt is at record levels, the CPI is deliberately understated and commodity prices are on the rise, there is only one currency that will survive intact: precious metals. For reasons we noted in Part 1, and because the Fed can’t simply shut off the money spigot at will, inflation is on its way. When it arrives it will accelerate rapidly and be very difficult to contain. An investment in gold and precious metals is the best way to inflation-proof your portfolio, shield it from eventual sky-high interest rates, and take advantage of a secular growth opportunity that has many years to run. In this troubling economic environment, it is time to strip away old thinking and plan a different kind of investment strategy, because the next 20 years will not be like the last 20. Now is the time to make an investment in the future, and the future is precious metals bullion. Nick Barisheff is President and CEO of Bullion Management Group Inc., a bullion investment company that provides investors with a cost-effective, convenient way to purchase and store physical bullion. Widely recognized in North America as a bullion expert, Barisheff is an author, speaker and financial commentator on bullion and current market trends. He is interviewed monthly on Financial Sense Newshour, an investment radio program in USA. For more information on Bullion Management Group Inc. or BMG BullionFund, visit: www.bmginc.ca . © 2009 Copyright Nick Barisheff - All Rights Reserved Disclaimer: The above is a matter of opinion provided for general information purposes only and is not intended as investment advice. Information and analysis above are derived from sources and utilising methods believed to be reliable, but we cannot accept responsibility for any losses you may incur as a result of this analysis. Individuals should consult with their personal financial advisors. 30 Nov 09, 01:48 Gold? I wouldn't buy your gold if you paid me to. I would buy energy or land, that produces income. You can always live off the land, but you cant eat a gold bar or drive a gold bar to work.